Oily skin, blackheads, pimples, acne, redness, dark spots, wrinkles. If you have any one of these skin issues then, this homemade facial scrub is for you. It brightens skin and tightens pores as it helps to clear up acne, pimples, and blackheads while working to help fade acne scars and those unsightly dark spots on skin. Plus, it’s anti-aging and helps fight wrinkles while leaving skin soft and smooth. Tomatoes are loaded with antioxidants and are very rich in Vitamins A, C, K, E, B1, B2, B3, and B6, all of which can be found in a slew of facial products today. The real power of the tomato lies in its juice which can effectively balance skin’s pH levels. The acidity can help naturally dry out oily pores and acne spots, hence reducing breakouts and preventing them in the first place. You can do this routine at least once or twice a week, which is plenty for a good physical exfoliation. Using half a tomato, sprinkle the fine granulated sugar on exposed part of the tomato. 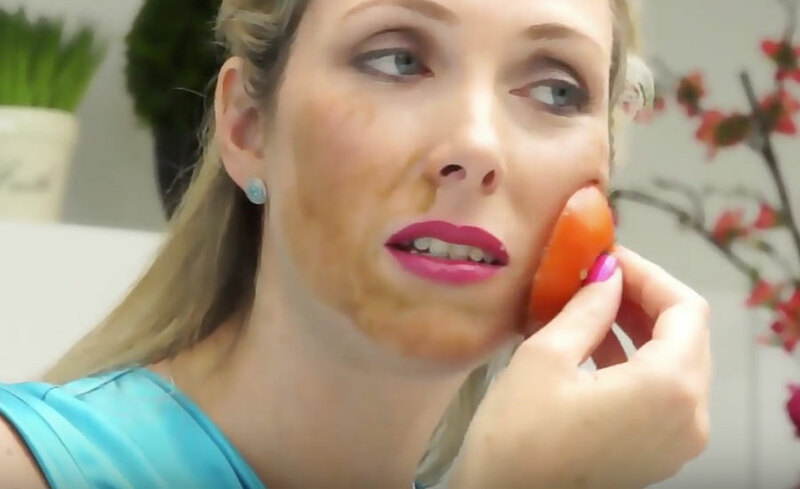 With slow circular motions, gently rub the tomato onto your cheeks, chin, forehead and nose area. Just one or two passes on each area, and remember light pressure! After a few minutes rinse the scrub off with warm water and follow with a moisturizer.